A few weeks back when we visited one of our friend’s house, we got the chance to try her Mom’s wonderful Kerala Style Fish Curry with Raw Mangoes. I was immediately hooked on to the taste and I asked aunty for the recipe. She is from Ernakulam and this is one of the ways in which Fish Curry is made in Ernakulam-Angamaly areas. This recipe was new to me as I mostly make Kerala style Fish Curry with Kudampuli or Tomatoes. We had this Raw Mango Fish Curry with Rice as well as aunty’s special Manja Kappa (Yellow Tapioca). This curry is really mild yet flavorful. It isn’t overpowered with spices unlike the other Red Fish Curry. 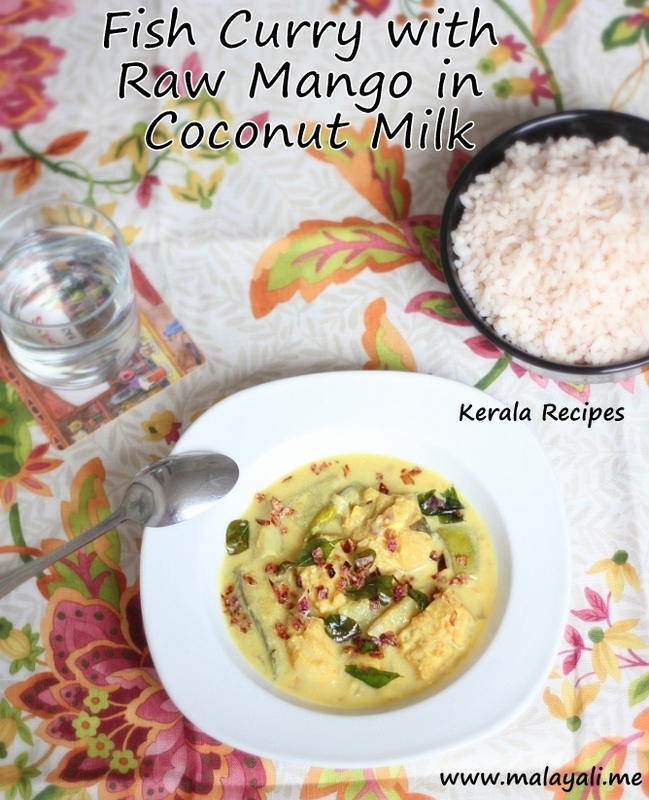 The gravy goes so well with rice as well as Tapioca (Kappa) and as you bite into the pieces of mango, you will be thankful for such good recipes from Kerala. 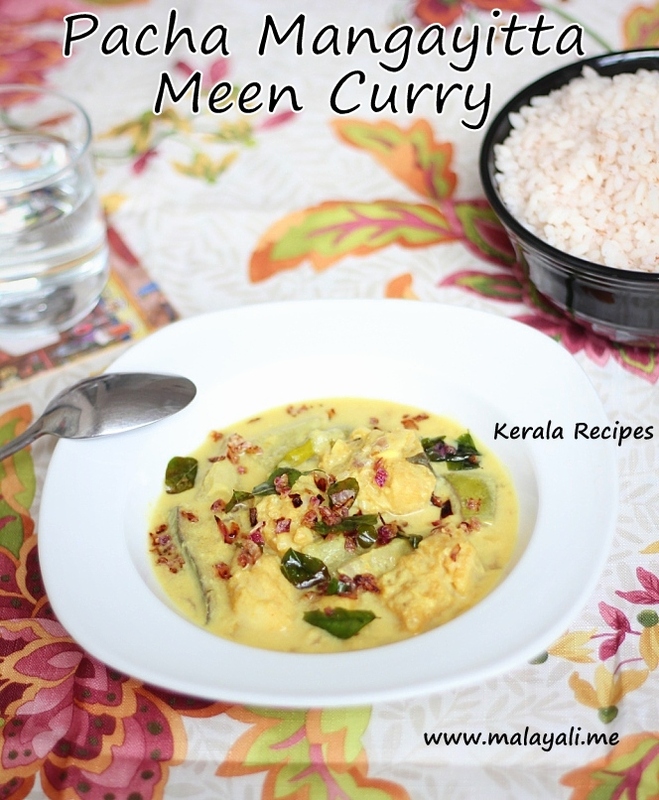 My mother-in-law makes a similar Fish Curry (Meen Mangayittu Vechathu) but instead of Coconut Milk, ground coconut paste is used. I will have to try out that recipe when I get a chance. Clean the fish and cut it into medium sized pieces. Soak it in water along with 1 tbsp lemon juice for a few minutes. Drain and keep aside. Wash and peel the mango. Dice it into medium sized pieces (1″ X 1″ approximately). Heat 1 tbsp oil in a manchatti (clay pot) or a wide pan. Throw in the sliced shallots and curry leaves. Saute for a few minutes until the shallots become translucent. Add the green chillies, ginger and garlic. Saute until the shallots begin to brown. Reduce heat and add turmeric and red chilly powders. Saute for a minute. Add the thin coconut milk to the pan along with salt to taste. Bring it to a slow boil. When it begins to boil, add the mango pieces. Let it cook for 5-7 minutes. Add the fish to the gravy. Make sure that the fish is covered in gravy. Cover and cook on medium-heat for 10-12 minutes, swirling the pan occasionally. Reduce heat and add thick coconut milk. Swirl the pan and remove from heat. Heat 2 tsp oil in another pan. Saute sliced shallots and curry leaves until the shallots are golden brown. Pour this seasoning over the fish curry. Keep covered for at least 4-5 hours so that the fish absorbs the flavors. You can use canned Coconut Milk or Coconut Milk Powder for convenience instead of freshly squeezed Coconut Milk. If you cannot get Raw green mangoes, you can use Frozen Cut Mangoes available in Indian grocery stores. I used a combination of both Fresh and Frozen Green Mango. I used Pacific Cod Fish fillets in this recipe. It is better to use thick, fleshy fish for this recipe. When do you put in the mango?